There are two things I feel the shop needs right now. Purses and jewellery. So I look at what I have - fabrics, beads, buttons and start to plan what I can make. Purses need a zip so first step will be buying some small size zips. These will determine the size of the purses. Then I'll experiment with some of the needlefelted pieces above to see what purses look like made with them. First I need to machine or hand embroider over the top of them to stabilise them for hard wear. 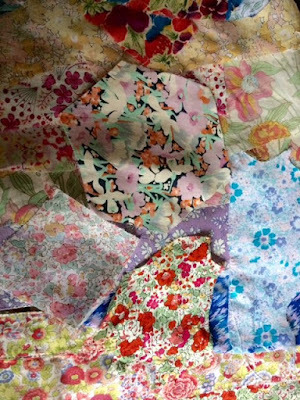 Liberty patchwork purses would also tick the box for me and I will give that a go and see whether the finished result is saleable or not. I've sketched out some new jewellery ideas which involve using some of the Liberty fabric. Watch this space! What are you planning and working on right now? Today Jenny Stacy did a bit of sewing and a bit of needle felting. The up side of having a quiet shop in February is that I can get lots of my own things made. And few things are more satisfying that puting colours and textures together and seeing what they look like. I use my own handmade felt and anything else that is to hand, especially if it's a bit glittery! By the way the red and white fabric is what I'm wearing, not part of what I'm making in case you were wondering...I'll share some better photos soon. 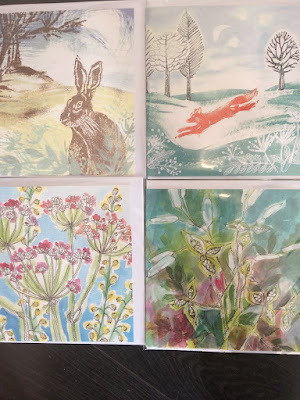 New card designs by Jacqui Watkins of Linen Prints. 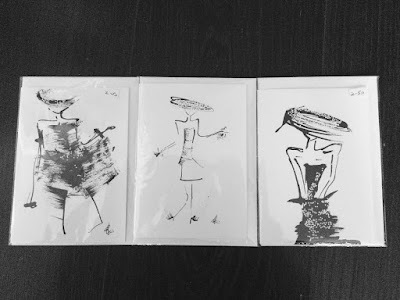 Handmade Happiness offers a large range of cards, most of them by local artists. Prices range from £1.95 to £7 with most of them priced at £2.50. 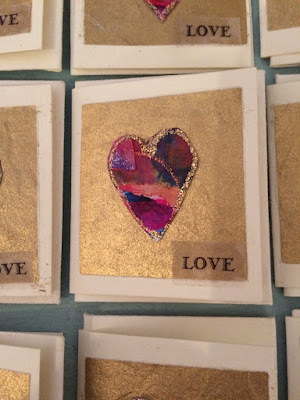 These pretty ceramic hearts made and hand-painted by Kate Hackett have just arrived in the shop. £3 each. Printed velvet settee and linen cushion by Boeme in Tara Interiors, my next door shop. Seen in Waitrose last night. Giant strawberries in February? As someone trying to do a low-carb diet these strawberries look especially apealling! But somehow I can't buy strawberries in February. Strawberries are for June aren't they? And they are £3.60 a tub - a price that puts them out of the reach of most people, including me! I had to share a picture of this settee that arrived at Tara Interiors yesterday.Just stunning! Kate Hackett's ceramic hearts are always popular and the two pictured above are just perfect to celebrate the arrival of Spring. Loving pale pink right now! February is the month when flowers are most needed. I like to have them in the house and in the shop. It's amazing how flowers in a vase perk up a room. Their feel-good factor is well worth the pennies they cost right now. We are all longing for spring sunshine and a relief from damp, cold, grey days. Flowers remind us that we haven't long to wait now. And pink and grey go rather well together don't you think? I'm getting some of that spring energy right now and today I plan to change the shop round so it looks and feels different. More spring-like ! 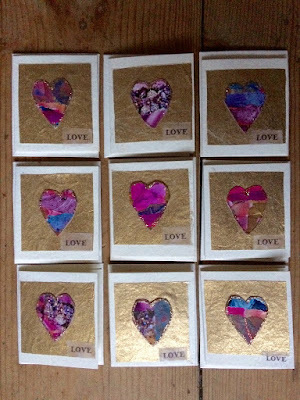 Close up of little Valentines cards by Jenny Stacy £2 each. 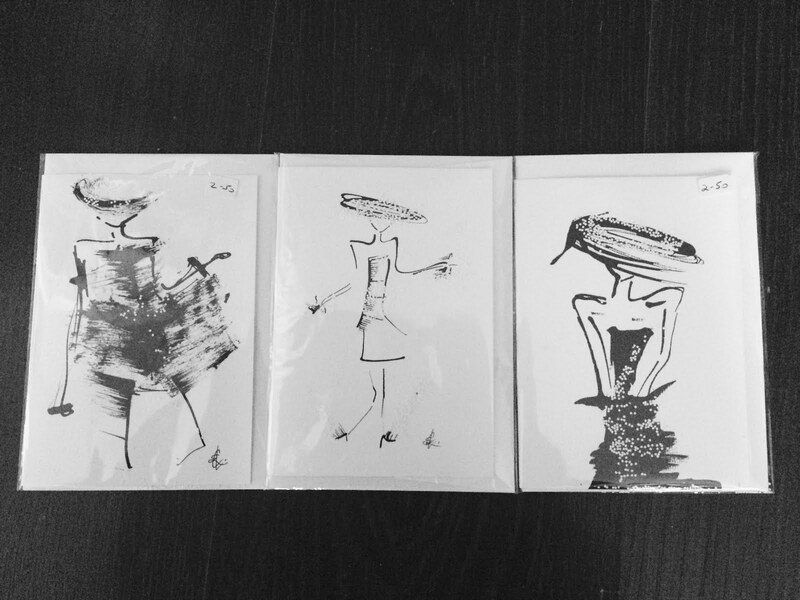 There's a choice of handmade cards in the shop for the special person in your life. For those who want to make a big romantic gesture how about buying a heart shaped wreath? The gold one sold today. Sparkly jewellery or a hand stitched bear would also make great Valentines gifts. It was good to receive a delivery of ten new cushions today. I only had a handful left after selling lots in the run up to Christmas. 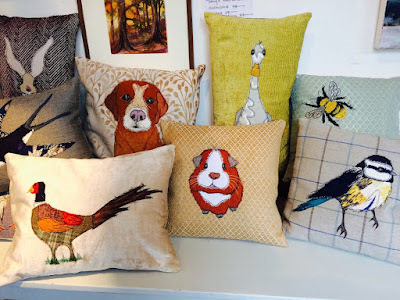 Tanya cleverly translates her sketches into thread portraits of animals and she uses excellent quality fabrics too. Prices range from £28 to £48. We discussed Tanya's pictures which she frames, like a smaller version of her cushions,and I look forward to being able to offer some for sale in the shop soon. 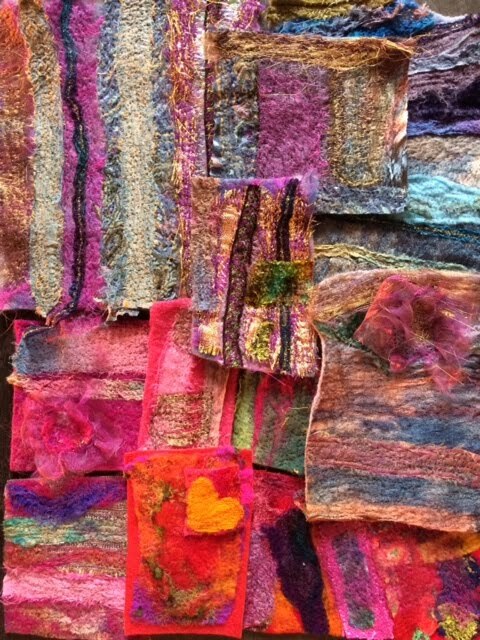 Love these scraps of velvet and felt. I also love mother of pearl dyed buttons. These have a matt finish. Wood bowl of bits on my work table. Oh yes, that's right, I did!